Optimal blood pressure target unknown. 2012 American Stroke Association guidelines suggests that a systolic BP goal <160mm Hg is reasonable. Avoid nitroprusside or NTG (increases cerebral blood volume / ICP). Use labetalol, nicardipine, enalapril. Lowering BP decreases risk of rebleeding in unsecured aneurysm, but may increase risk of infarction. CPP = MAP – ICP. Increased ICP necessitates an elevated MAP to keep CPP. CPP threshold may be 70mm Hg. In the absence of ICP measurement, clinical findings (i.e. alertness) may guide therapy, Uptodate recommends keep SBP <140mm Hg in these instances. Cerebral autoregulation is disrupted in about a third of patients with severe TBI, these patients are described as “pressure-passive.” In these patients, rise in MAP leads to elevated ICP due to increased cerebral blood volume, while drops in MAP may be associated with hypoperfusion and ischemia. Bedside measurement of cerebral blood flow is not easily obtained. CPP = MAP – ICP, is a surrogate measure. Low MAP, high ICP or low CPP are associated with secondary brain injury and worse outcomes. Old strategy to induce hypertension to CPP >70mm Hg (using saline boluses or vasopressors) does not improve outcome, and increases risks of other complications s.a. ARDS. 2007 Guidelines from BTF recommend CPP target of 60 mm Hg, avoid <50 and >70 mm Hg. In children, lower thresholds are recommended (40-65 mm Hg). Target ICP first before MAP. [coming soon] Our practice is to keep SBP within 100-150mm Hg during the immediate post-operative period. After stroke, CPP distal to obstructed vessel is low and distal vessels are dilated. Blood flow depends on systemic blood pressure. Elevated BP is necessary to maintain perfusion in ischemic penumbra. BP rises spontaneously after stroke, this is transient and BP falls by as much as 20/10 within 10 days. Analysis from International Stroke Trial showed a U-shaped relationship between SBP and outcomes. SBP >200mm Hg is associated with risk of recurrent stroke while SBP <120mm Hg was associated with excess number of deaths from coronary heart disease. Lowering BP within 24 hours of acute stroke has been associated with clinical deterioration. Some may even benefit from pharmacologic increases in BP (studies show improvement in aphasia or perfusion imaging). [Induced HTN currently not recommended except in the setting of a clinical trial.] Severe increase in BP can also cause hypertensive encephalopathy. No good RCTs to guide BP management in hyperacute phase (<12hours) of stroke. For patients eligible for tPA: Blood pressure goal ≤185/110 mmHg is recommended prior to starting lytic therapy. Maintain BP ≤180/105 mmHg x 24 hours after tPA. *Ongoing ENCHANTED trial is assessing effects of early intensive BP lowering post-tPA. Results expected in early 2019. For patients not treated with tPA: most guidelines recommend no treatment for BP unless hypertension is extreme (SBP >220mm Hg or diastolic >120m Hg) or patient has active ischemic coronary disease, heart failure, aortic dissection, hypertensive encephalopathy, acute renal failure, or pre-eclampsia / eclampsia. If so, lower BP by ~15% during first 24 hours. Guidelines suggest IV labetalol and nicardipine as first-line antihypertensives. Blood Pressure s/p thrombectomy: optimal BP range not well defined; keep SBP 150-180mm Hg prior to reperfusion (to maintain adequate collateral flow while occluded); keep SBP <140mm Hg once recanalized. Elevations in BP may cause hemorrhage to expand, but increased MAP may be necessary to maintain cerebral perfusion. INTERACT2 trial compared intensive BP lowering (<140mm Hg within 1 hour) vs traditional management (<180mm Hg) in patients with acute ICH (within 6 hours). Intensive BP lowering improved modified Rankin scores, with similar adverse events. INTERACT study suggested that more aggressive BP lowering is associated iwth reduced hematoma growth. ATACH II is in progress. Useful IV antihypertensives include: labetalol, nicardipine, esmolol, enalapril, hydralazine, nitroprusside, and nitroglycerin. [coming soon] Some neurosurgeons routinely keep MAP goals >85 mm Hg in spinal surgeries where perfusion of the spinal cord is critical. 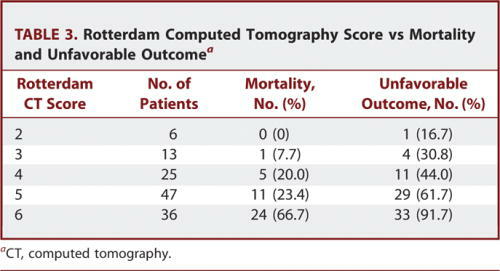 Evidence for this practice is lacking, whereas the harms from induced hypertension and prolonged ICU stay is real. Uptodate. “Treatment of Aneurysmal Subarachnoid Hemorrhage.” Accessed 07/07/2016. Uptodate. “Initial assessment and management of acute stroke.” Accessed 07/07/2016. Uptodate. “Management of acute severe traumatic brain injury.” Accessed 07/07/2016. Uptodate. “Spontaneous intracerebral hemorrhage: Treatment and prognosis.” Accessed 07/07/2016. Anderson, Craig S. et al. “Rapid Blood-Pressure Lowering In Patients With Acute Intracerebral Hemorrhage”. New England Journal of Medicine 368.25 (2013): 2355-2365. Burns, J., Fisher, J. and Cervantes-Arslanian, A. (2018). Recent Advances in the Acute Management of Intracerebral Hemorrhage. Neurosurgery Clinics of North America, 29(2), pp.263-272. Appiah, K., Minhas, J. and Robinson, T. (2017). Managing high blood pressure during acute ischemic stroke and intracerebral hemorrhage. Current Opinion in Neurology, p.1. Giacino, Joseph T. et al. “Placebo-Controlled Trial Of Amantadine For Severe Traumatic Brain Injury”.New England Journal of Medicine 366.9 (2012): 819-826. The final score is the sum of the scoring items + 1. 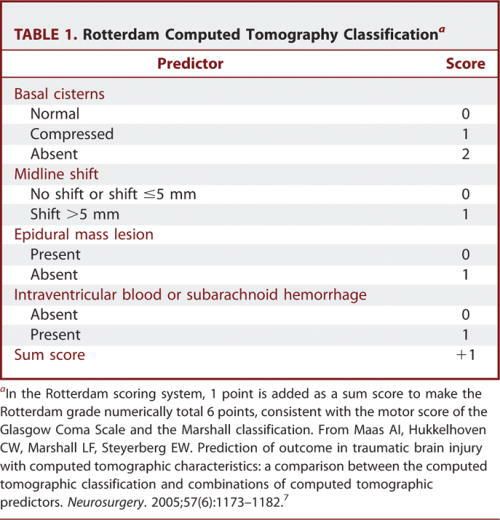 A scoring system for severity of traumatic brain injury, based on admission noncontrast head CT scan.